Which may or may not be in referral to Chris Beeezy. He was reportedly having an intimate relationship with a female worker at his now old research facility, but Karrueche reportedly says that she broke up with Chris a month ago; after finding vulgar images and texts in the singers phone. The model and wardrobe assistant to Brown did not attend his last court appearance either. TMZ reports Chris banged a rehab facility worker, which led to his departure. 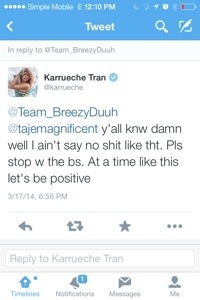 Karrueche says she didn’t know about the incident until the was released in the news. Lindsays talk with Oprah aired on OWN on Sunday night. In the interview, she reflected on being addicted to alcohol and Aderrall. She seemed to be taking responsibility for her actions and said that she felt she was also addicted to “chaos” in her life and felt like she had “abused” her talents.” Some feel like oprah was protective of Lindsay because of the stars upcoming show on the OWN Network and therefore didn’t ask her many of the questions fans wanted answers to. Lilo also spoke on her parents and how they’re not perfect. But she definitely took responsibility for her actions as an adult. When asked about her mom and dad individually, She added that she did not feel like she was exploited by her mom. But when Oprah asked if she felt betrayed by her dad selling their infamous father/daughter phone conversation to a media outlet, the look of hurt a nd resentment surely appeared on that cute freckled face that audiences fell in love with years ago. We hope that this is truly a healthy new chapter in lilo’s life. Lindsay in Soho on Aug 18, 2013.